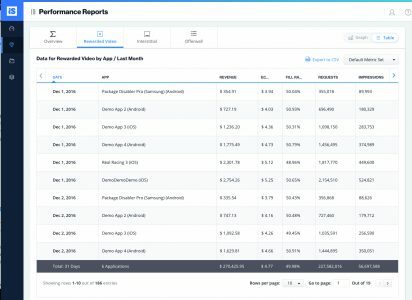 Our Performance Reports aim to deliver valuable insight and analytics to understand your monetization performance. 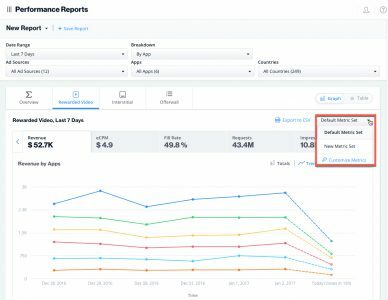 With in-depth filters and helpful breakdowns, your Performance Reports provides the necessary granular data you need to make calculated decisions to achieve monetization success! 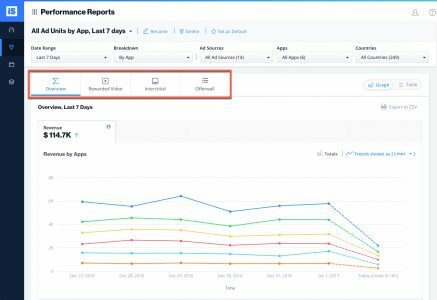 All apps with at least one active ad unit will appear in your Performance Reports Dashboard. If you’d like to view reports that portray the performance of the ironSource Network exclusively, you can find them under ironSource Network. If you have saved reports in the past, you can find them in the dropdown accessible in the Report Title. Date Range, breakdowns and filters can be found at the top of the page. 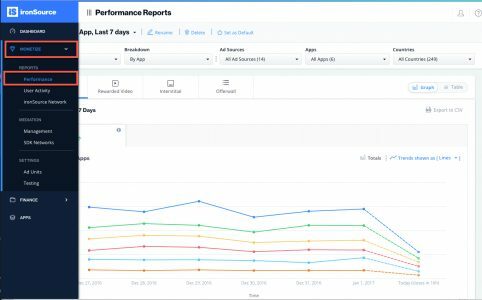 Use these to deep dive into your app’s performance and better understand your ad activity. These filters make it easier to find specific results and separate the rest of the data to simplify the report. 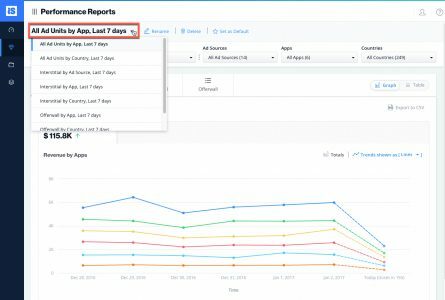 Countries: Refine your reports by country to understand your apps’ performance based on the geo. You can choose to simply include or exclude certain countries. Date Range: Choose the time frame for your report. Select any predefined range or create a custom date range. Ad Source Placement Device Type New! Ad Source Instance Segment App Version New! App OS version New! SDK Version New! Metric Totals in Table You can view a summary of the metrics portrayed in your report in table format, below the graph. The numbers in the table are a total of each metric, i.e. 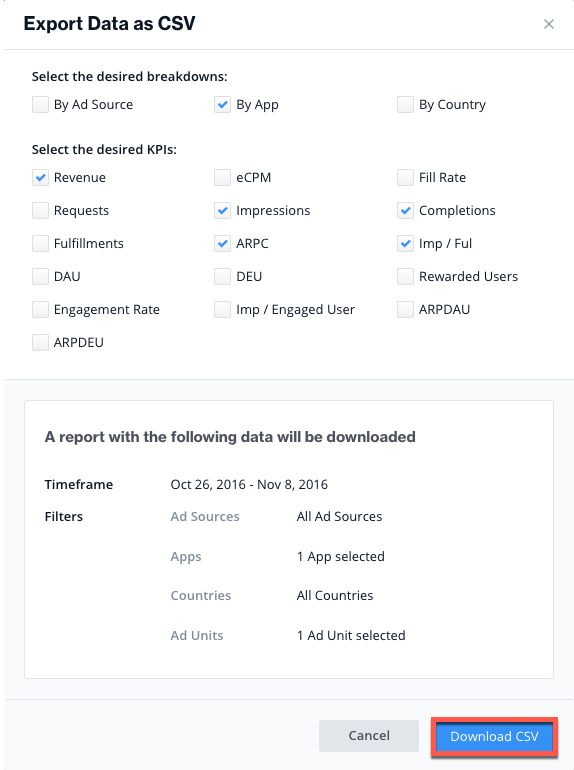 the total revenue, eCPM, impressions, Ad Availability Checks from a given ad source. The table reflects the identical breakdowns and filters you defined for the graph. Browse between the metrics by clicking on them. The graph will change according to the selected metric; for example, when selecting ‘eCPM‘, the graph will portray the data for this specific metric. Click on the separate metrics to see dedicated graphs for that metric. 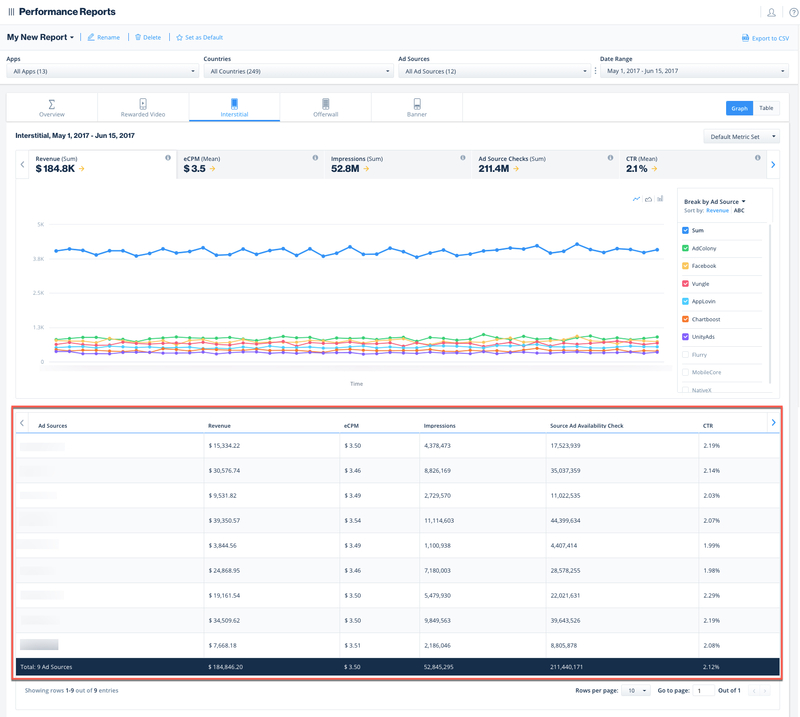 You can create custom metric sets in the individual ad unit tabs that provide granular data on your ad performance, by clicking ‘Customize Metrics‘. You will then be able to create your own metric set and save it for future use. Note: The Default Metrics vary slightly based on the ad unit. 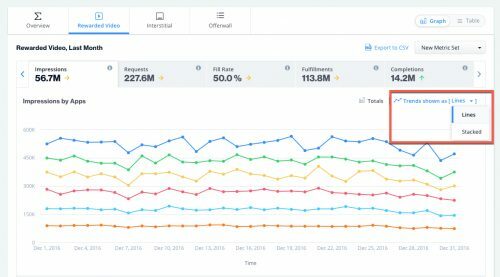 For example for Interstitial, CTR is part of the Default Metrics Set, while for Rewarded Ad Units, Fill Rate is part of the Default Metrics Set. 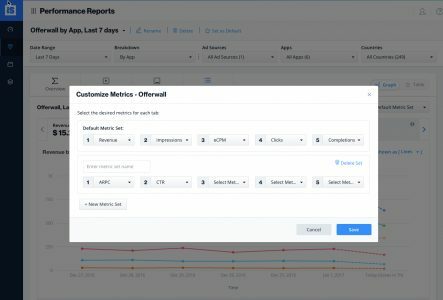 You can change the metrics for your ‘Default Metric Set‘ or add a new metric set. Your metric sets will be saved per ad unit. When adding a new metric set, enter a relevant name for the metric set and choose from the list (find a list of all our supported metrics below). Then click ‘Save‘. 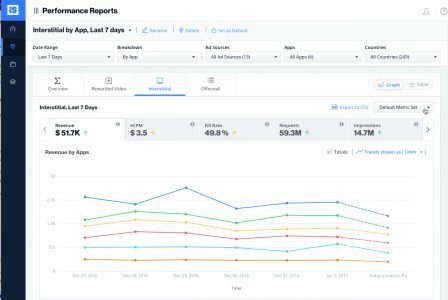 ironSource provides deep insights into your app’s ad performance with a wide range of metrics. 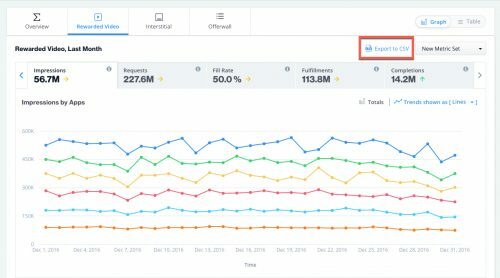 These advanced metrics allow you to understand how well your ad units are performing, which ad source is proving most profitable, etc. ; allowing for better implementation and control. 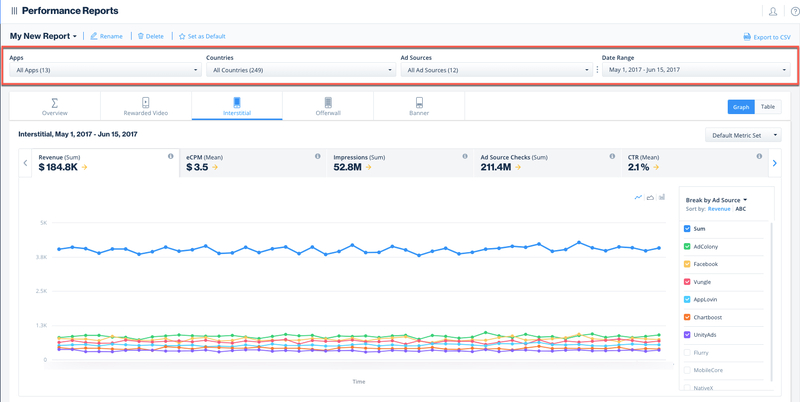 Note: Supported metrics might differ slightly based on the ad unit. Availability Rate: The rate at which an ad source had an ad available when an ad was requested. Sessions: The sum of single periods of user interaction with your app (each SDK init generates a new session). Once you save your metric set, you will be able to see it in the Metric drop-down on the top right of the graph. The following window will open and you can verify your breakdowns and metrics (KPIs). Make sure the Date Range is correct. Click ‘Download CSV’ and the file will download to your computer. 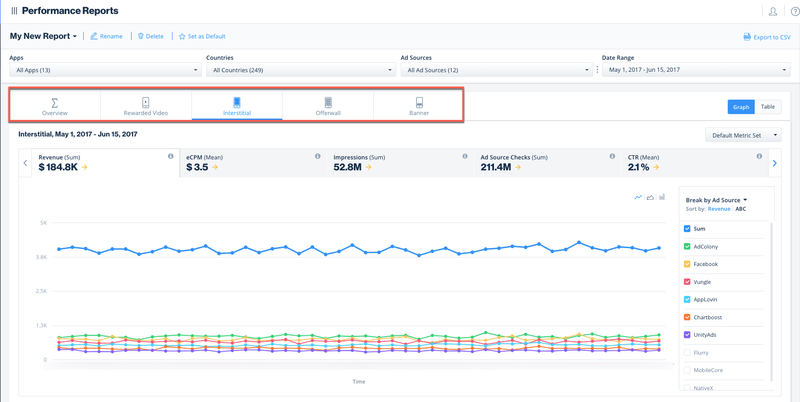 Make sure to check out your User Activity Reports to gain valuable insights on how your users interact with your ads.